SS 108804 Stoker 1st Class of the Royal Navy, HMS Indefatigable. Born in Edinburgh 12 September 1890. Died 31 May 1916 aged 26 at the Battle of Jutland when his ship was lost. 966514 Gunner Bertram Robert Bennett of "B" Battery, 303rd Brigade, the Royal Field Artillery. Adopted son of Charles and Elizabeth Willis of Bere Ferrers. Born in Bere Ferrers in 1894. Died 7 November 1918 aged 25. TF/1197 Driver Frederick Bertie Blackmore of "C" Battery, 218th Brigade, the Royal Field Artillery. Son of Arthur and Mary Blackmore of Fore Street, Bere Alston; brother of Leonard (below) Born in Exmouth in 1896. Died 28 September 1916 aged 20. 126330 Private Leonard Stanley Blackmore of the 17th Battalion, the Machine Gun Corps Infantry; formerly 36269 of the East Surrey Regiment. Son of Arthur and Mary Blackmore of Fore Street, Bere Alston; brother of Bertie (above). Born in Exeter St Thomas in 1898. Died 22 March 1918 aged 19. K/16024 Stoker 1st Class James William Brewer of the Royal Navy, HM Submarine E22. Son of Elizabeth Brewer of Bedford Street, Bere Alston. Born in 1897 at Spike island, Ireland. Died 25 April 1916 aged 19. E22 was torpedoed and sunk by UB.18. 26528 Lance Corporal George Henry Brighton of the 10th Battalion, the Duke of Cornwall's Light Infantry. Son of Leah Brighton and the late Joseph Brighton. Born in Bere Alston in 1881. Died 4 May 1917 aged 36. 305526 Ship's Corporal William Arthur Collom of the Royal Navy, HMS Diana. Son of William and Katherine Collom; husband of Susannah Collom of Devonport. Born 19 November 1885 in Bere Ferrers. Died 16 November 1916 of illness in Singapore aged 31. 315226 Private Thomas Nichols Coombes of the 1st/ 5th Battalion, the Devonshire Regiment. Stepson of William and \Mary Ann Coombes; husband of Emily Coombes of Bedford Street, Bere Alston. Born in Bere Ferrers in 1881. Died 14 September 1918 aged 37. 20335 Private William Cecil Cradick of the 9th Battalion, the Devonshire Regiment. Son of William and Mary Cradick. Born in Bere Alston in the June Quarter of 1896. Died 1 July 1916 aged 20. 77508 Private William John Davis of the 15th Battalion, the Canadian Infantry (Central Ontario Regiment). Son of Christopher and Alice Davis of Bere Ferrers. Born in Bere Ferrers in 1885. Died 3 June 1916 aged 31. A Canadian citizen. 1309 Gunner Thomas John Foote of "C" Battery, 218th Brigade, the Territorial Battalion, the Royal Horse and Field Artillery. Son of Thomas and Mary Ann Foote. Born in Bere Ferrers in 1891. Died 20 November 1916. Buried in Bere Alston churchyard. 345350 Private Hubert John Grills of the 16th Battalion, (Royal Devon and Royal North Devon Yeomanry Battalion), the Devonshire Regiment.. Son of Charlotte and the late John Grills of Edgcumbe House, Bere Ferrers. Born in Torpoint 21 June 1889. Died 3 December 1917 aged 28. 139874 Stoker 1st Class Edmund Herbert Greenway of the Royal Navy, HMS Goliath. Next of kin was his sister Mrs. Armande Marsden of Bedford Street, Bere Alston. Born in Brier, Isles of Scilly 31 July 1867. Died 13 May 1915 aged 48. He was a naval pensioner who returned to active service. M2098 2nd Ship's Steward James Henry Gliddon of the Royal Navy, HMS Europa. Son of Lucy Gliddon of Bedford Street, Bere Alston and the late Joseph Gliddon. Born in Bere Alston 17 October 1889. Died from illness 7 January 1916 aged 37. 345726 Private Thomas Hooper of the 16th Battalion, (Royal Devon and Royal North Devon Yeomanry Battalion), the Devonshire Regiment. Son of Richard and Rebecca Hooper of Pepper Street, Bere Alston. Born in Bere Alston in 1892. Died 4 September 1918 aged 26. 305025 Petty officer Stoker William Edward Hugh Homeyard of the Royal Navy, HMS Indefatigable. Son of John and Fanny Homeyard of 23 Bedford Street, Bere Alston; husband of Maud Homeyard of 16 Coburg Street, Plymouth. Died at the battle of Jutland 31 May 1916 aged 32. 308897 Petty Officer Stoker Reginald W. Homeyard of the Royal Navy, HMS Victory. Son of John and Fanny Homeyard of 23 Bedford Street, Bere Alston; brother of William (above). Born in Bere Alston 3 May 1886. Died of illness 9 October 1918 aged 32. 5736 Rifleman John Jordan of the 21st Battalion (1st Surrey Rifles), the London Regiment; formerly 24357 of the Duke of Cornwall's light infantry. Son of Mary Ann Jordan of Cornwall Street, Bere Alston and the late John Jordan. Born in Yealmpton in the December Quarter of 1886. Died 15 September 1916 aged 21. 241378 Private William Henry Jackman of the 7th Battalion, the Queen's Own (Royal West Kent Regiment). Son of Eliza and Philip Jackman. Born in Yelampton in 1887. Died 25 March 1918 aged 31. 16579 Private Richard Wallace Jackson of the 2nd Battalion, the Devonshire Regiment. Son of Septimus and Annie Jackson. Born in Bere Ferrers in 1894. Died 14 April 1917 aged 23. 235202 Able seaman Cuthbert Henry Kerswill of the Royal Navy, HM Submarine E24. Husband of Edith Kerswill of Cornwall Street, Bere Alston. Born in Cardiff 3 December 1888. Died 27 March 1916 aged 28 when his submarine was mined and sank. 10418 Corporal Frederick William Lavis of the 8th Battalion, the Devonshire Regiment. Son of Selina Lavis of 30 Cornwall Street, Bere Alston and the late John Lavis. Born in Bere Alston in the September Quarter of 1894. Died 7 May 1916 aged 21. 205057 Private 8th Battalion, the Devonshire Regiment. Son of William and Eliza Littlejohns. Born in Bere Alston in the December Quarter of 1897. Died 26 October 1917 aged 20. 10389 Private Alfred Lethbridge of the 8th Battalion, the Devonshire Regiment. Son of John and Elizabeth Lethbridge. Born in Dolton in 1895. Died 25 September 1915 aged 20. 43182 Reginald James Newcombe Nicholls of the 13th Battalion, the Devonshire Regiment: transferred as 173540 315th Home Service Company. Son of Nelson and Fanny Nicholls of 10 Edgcumbe Terrace Bere Alston. Born in Bere Alston in the September Quarter of 1893. Died 31 May 1919 aged 26. Buried in Bere Alston churchyard. 2703 Private Joseph Stanley Pethybridge of the 51st Battalion, the Australian Infantry. Son of William and Ellen Pethybridge of New Zealand. 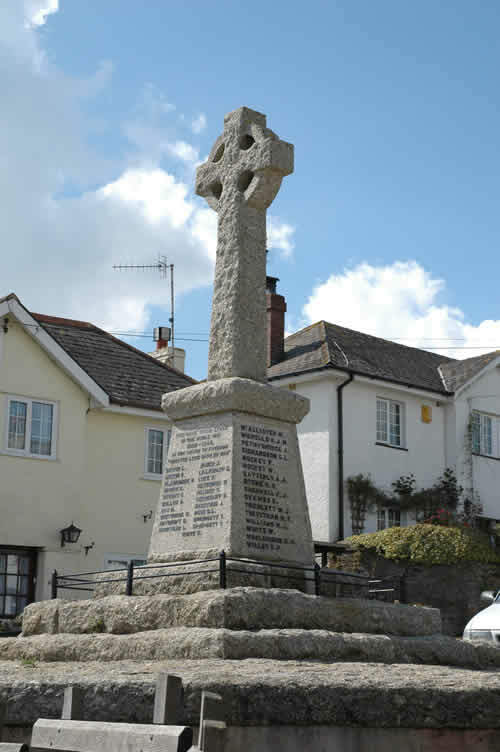 The family lived in Bere Alston until emigrating in 1891. Born in Bere Alston in 1889. Died 25 April 1918 aged 29. 95902 Private Fred Rockey of the Royal Army Medical Corps: transferred to the Labour Corps as 523025. Son of Alfred and Emily Rockey of Climsland Cottage, Bere Alston. Born in Bere ferrers in 1897. Died 10 February 1919 aged 21. Buried in Bere Alston churchyard. Believed to be V 312 Stoker William Edward Rooney of the RNVR. Son of Daniel Rooney of the Coastguard service and his wife Bessie. Born in Devonport in the March Quarter of 1890. Died in HMS Vivid (shore base) 4 July 1918 of illness aged 28. 866106 Driver Augustus Alfred Satterly of 1096 Battery, 218th Brigade, the Royal Field Artillery. Son of William and Charlotte Satterly. Born in Ide in the June Quarter of 1889. Died 5 March 1919 aged 30. Buried in Bere Alston churchyard. PLY 13948 Bugler Horace Charles Stone of the Royal Marine Light Infantry, HMS Goliath. Son of John and Mary Stone of Bere Ferrers. Born in Stonehouse 13 June 1892. Died 13 May 1915 aged 21. 40230 Private Frederick John Sherrell of the 1st/5th Battalion, the Gloucestershire Regiment. Son of John and Sarah Sherrell of Bere Ferrers. Born in Bere Ferrers in the September Quarter of 1893. Died 8 November 1918 aged 25. Believed to be the son of Samuel and Emma Skewes or Skuse of Bere Ferrers. Born in Buckland Monachorum in 1888. No details of his military history are yet confirmed. 14134 Private William James Treml;ett of the 2nd Battalion, the Dorsetshire Regiment; formerly 1821 of the Devonshire Regiment. Son of Ernest Tremlett and the late Nellie Tremlett. Born in Bere Ferrers in 1897, Died 25 March 1917 aged 20. T 1894 Conductor (i.e.Warrant officer) of the South African Army Service Corps. Son of Joseph and Mary Jane Trevethan of Barton House, Bere Ferrers. Born in Bere Ferrers in 1872. Enlisted to fight in S. Africa 3rd February 1900 - he decided to remain in South Africa when his regiment returned home. Died 25 December 1918. aged 46. 42430 Private William John Williams of the 2nd Battalion, the Royal Berkshire Regiment. Son of William and Beatrice Williams of Frog Street, Bere Alston. Born in Bere Alston in 1899. Died 26 April 1918 aged 19. 51951 Gunner Walter White of the Royal Garrison Artillery. Son of John and Ann White of Bere Ferrers. Born in Bere Ferrers in 1889. Died 30 April 1918 aged 29. 10393 Private George Willey of "D" Coy, the 8th Battalion, the Devonshire Regiment, Husband of Louisa Willey of Gully Town, Bere Alston. Born in Exeter in 1886 but grew up in Bere Alston. Died 25 September 1915 aged 30. K18390 Stoker 1st Class Abel Harry Woolridge of the Royal Navy, HMS Defence. Son of Caleb and Emma Jane Woolridge of Ley Cottages, Bere Ferrers; brother of Archibald (see below). Born in Bere Ferrers 22 March 1894. Died 31 May 1916 aged 22. K 20971 Leading Stoker Archibald David Wooldridge of the Royal navy, of submarine depot ship HMS Lucia. Son of Caleb and Emma Jane Woolridge of Ley Cottages, Bere Ferrers; brother of Abel (see above). Born in bere |Ferrers in 1892. Died 6 August 1920 aged 28 as the result of an accident. Buried in Bere Ferrers churchyard.